Although grebes are primarily fish-eaters (they swallow their own feathers to cushion the sharp bones), this species also consumes significant numbers of crayfish, sometimes detaching the pincers before swallowing the good part. Native to southern swamps and bayous, the red swamp crayfish has been introduced in the Sacramento Valley and San Francisco Delta. According to the US Geological Survey, the species is established at Coyote Hills Regional Park and elsewhere around the Bay. The crayfish preys on the larval stages of native frogs (including the endangered California red-legged frog) and newts. Recent research led by Gary Bucciarelli at UCLA suggests that red swamp crayfish in Southern California streams interfere with the ability of aquatic dragonfly nymphs to control mosquito larvae, including those of species whose adults are vectors of malaria and other diseases. In lab experiments, the crayfish appeared to disorient or intimidate the dragonflies, and eventually ate them. 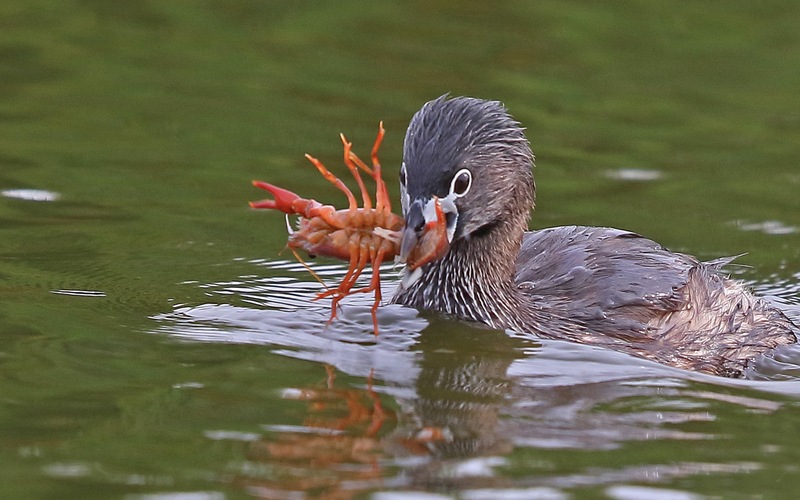 Pied-billed grebes are providing valuable biocontrol services in the Estuary by consuming red swamp crayfish, an invasive crustacean known to disrupt ecosystems. Although grebes are primarily fish-eaters (they swallow their own feathers to cushion the sharp bones), this species also consumes significant numbers of crayfish, sometimes detaching the pincers before swallowing the good part. Native to southern swamps and bayous, the red swamp crayfish has been introduced in the Sacramento Valley and San Francisco Delta. According to the US Geological Survey, the species is established at Coyote Hills Regional Park and elsewhere around the Bay. The crayfish preys on the larval stages of native frogs (including the endangered California red-legged frog) and newts. Recent research led by Gary Bucciarelli at UCLA suggests that red swamp crayfish in Southern California streams interfere with the ability of aquatic dragonfly nymphs to control mosquito larvae, including those of species whose adults are vectors of malaria and other diseases. In lab experiments, the crayfish appeared to disorient or intimidate the dragonflies, and eventually ate them. Joe Eaton writes about endangered and invasive species, climate and ecosystem science, environmental history, and water issues for ESTUARY. He is also "a semi-obsessive birder" whose pursuit of rarities has taken him to many of California's shores, wetlands, and sewage plants.